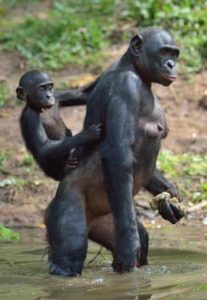 GEORGE WASHINGTON UNIVERSITY—WASHINGTON (April 28, 2017)—A new study examining the muscular system of bonobos provides firsthand evidence that the rare great ape species may be more closely linked, anatomically, to human ancestors than common chimpanzees. Previous research suggested this theory at the molecular level, but this is the first study to compare in detail the anatomy of the three species. “Bonobo muscles have changed least, which means they are the closest we can get to having a ‘living’ ancestor,” said Bernard Wood, professor of human origins at the GW Center for the Advanced Study of Human Paleobiology. Scientists believe that modern human and common chimpanzee/bonobo lineages split about 8 million years ago with the two great ape species splitting about 2 million years ago. As common chimpanzees and bonobos evolved after their split, they developed different traits and physical characteristics, even though they remained geographically relatively close, with their main division being the Congo River. Because of this, researchers have been curious as to what those differences are and how they compare to humans. By studying the muscles of bonobos (which indicates how they physically function), the team was able to discover that they are more closely related to human anatomy than common chimpanzees, in the sense that their muscles have changed less than they have in common chimpanzees. Earlier studies examined the DNA similarities and differences between bonobos and common chimpanzees, but this was the first study to compare the muscles of the three species. The researchers led a team that examined seven bonobos from the Antwerp Zoo that had died and were being preserved. Researchers said this was an extremely rare opportunity given bonobos’ status as an endangered species. The scientists note that having a clear understanding of what makes humans different from our closest living relatives might lead to new breakthroughs or understandings of human health. The paper, “Bonobo anatomy reveals stasis and mosaicism in chimpanzee evolution, and supports bonobos as the most appropriate extant model for the common ancestor of chimpanzees and humans,” published in Scientific Reports, a Nature publication, this month. 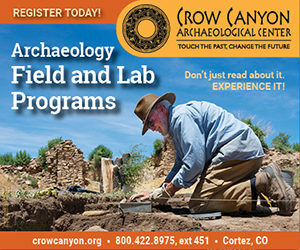 Subscribe to Popular Archaeology Premium. Available on all laptops and mobile devices, and still the industry’s best value at only $9.00 annually. 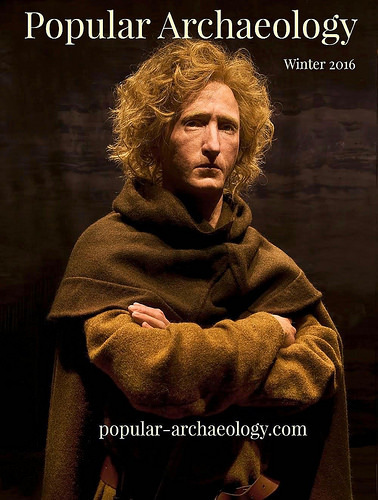 This richly illustrated issue includes the following stories: Recent findings shedding new light on the whereabouts of the remains of Philip of Macedon, father of Alexander the Great; how an archaeologist-sculptor is bringing bones of the dead back to life; archaeologists uncovering town life at the dawn of civilization; an exclusive interview with internationally acclaimed archaeologist James M. Adovasio about what makes the Meadowcroft Rockshelter prominent in the ongoing search for the first Americans; what archaeologists are finding at the site of the ancient city of Gath, the home town of the biblical Philistine giant, Goliath; and how scientists are redrawing the picture of human evolution in Europe. Find it on Amazon.com.